A contribution to the Piloting of the Multiple Evidence Base Approach From the community of Hin Lad Nai, Chiang Rai, Thailand. 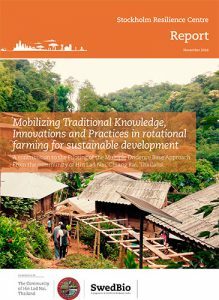 This report presents the outcomes of a collaborative partnership between Pgakenyaw Association for Sustainable Development, Thailand and SwedBio for piloting a Multiple Evidence Base approach to co-generate knowledge and methods for mutual learning across knowledge systems. Hin Lad Nai community has regenerated forests destroyed through logging and revived biodiversity through practising their rotational farming system developed by the Karen people. This pilot project was designed and implemented by the community as part of their ongoing systematic work to document and create opportunities for learning about Karen natural resource management which is shaped by their cosmology, knowledge and practices. The aim is to make fully visible its contribution to biodiversity conservation and sustainable use, as a base for enhanced policy development and decision-making at local, national and international levels.